Darwin, Kununurra, Wyndham, Broome, Port Hedland, Karratha. Tura presents the 2018 instalment of the multi-award winning Regional Touring Program. Kimberley Echoes is a powerful cross-cultural celebration created over 5 years of musical collaboration and experiences across the Kimberley, its landscapes and its people. Curated by Tura New Music, an ensemble has evolved featuring Aboriginal artists Mark Atkins, didgeridoo/vocals, and Stephen Pigram, vocals/guitarist, with cellist Tristen Parr, violinist Erkki Veltheim, guitarist Stephen Magnusson, percussionist Joe Talia and flautist Tos Mahoney – The Narlis. 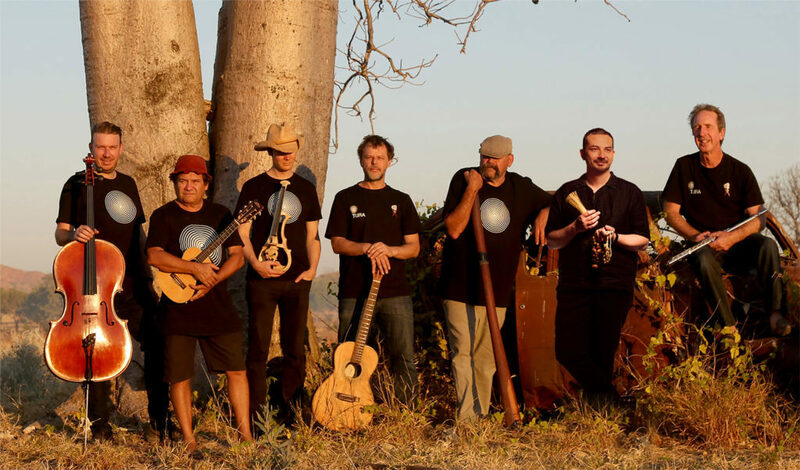 Songs by Pigram and Atkins, powerfully arranged by this unique ensemble, are juxtaposed with new instrumental works reflecting stories of country, history and passion. Over the evolution of Kimberley Echoes, The Narlis have collaborated with many local artists and experienced many Joonba (traditional Aboriginal dance and song events), all weaving their influence into their work and the program. The Tour ensemble will also collaborate with artists across the Kimberley including Gabriel Nodea, Susie Quicke, Naomi Pigram, Paul Boon and the Waringarri Dancers. Travelling through the breath-taking landscape of the Kimberley, touring to regional centres and remote communities, stunning performances will transport audiences to new worlds and inspire communities. Tura’s Regional Projects promote collaboration and direct involvement with the musicians by participants and audiences. Through the music outreach programs the touring artists engage directly with individuals and groups in the communities, encouraging direct interaction with the musicians and provides access, involvement and active participation with music. As well as public concerts, The Regional Tour’s community engagement includes school and community workshops and presentations. The program makes a significant contribution to the social, cultural, educational and community lives of people living in regional centres and remote communities of northern Australia. The Kimberley Echoes Tour is supported by the State Government through the Department of Local Government, Sport and Cultural Industries, Lotterywest and the Royalties for Regions program and the Australia Council’s Contemporary Music Touring Fund, Healthway promoting the Act-Belong-Commit message, The Ian Potter Foundation and the Rowley Foundation.